Heiner Müller was one of the most important German dramatists of the 20th century. After his drama Die Umsiedlerin (The Resettler Woman) was censored in 1961, following a single performance, many of his plays prohibited in the GDR were staged in the West. The core of the constantly expanding Heiner-Müller-Archiv / Transitraum is Müller's personal library. While Müller's manuscripts are kept at the Academy of Arts, his library constitutes a separate collection run by the Institute for German Literature at the Humboldt-University of Berlin. Many regard Heiner Müller as the most important German-speaking dramatist of the 20th century, after only Bertolt Brecht. He did not see himself as a member of the opposition in the GDR, but nonetheless became one. He did not fight against the system, but tried to change it from within, through his cultural works. After the construction of the Berlin Wall in 1961, Müller and other intellectuals and artists, had the illusion of being able to openly discuss the internal contradictions of the GDR. His play "Die Umsiedlerin" [The Resettled (woman) – the East German term for the German expellees from the former eastern territories] on the collectivization process in the country was immediately banned - as were his later works-, and Müller was expelled from the GDR’s Writers' Union. Since 1968, his plays were staged in the West. Heiner Müller became a cross-border commuter between the two German systems. Nevertheless, “he cannot be imagined without the GDR" - as the head of collection of the Heiner-Müller-Archiv / Transitraum, Kristin Schulz, formulated. After the end of the GDR, Müller stated provocatively that in a democracy, he could no longer write dramas. During the mass demonstrations on November 4, 1989, he was one of the speakers at Alexanderplatz in Berlin. From 1990 to 1993, Müller was the last president of the East German Academy of Arts, which also took over most of his estate as an all-German institution in 1998. However, Müller's working library that had always been an important place for him to retreat, reflect and be inspired, came to the Institute for German Literature at the Humboldt-University in Berlin. This was in order to maintain his personal library as a publicly accessible workplace and research center. 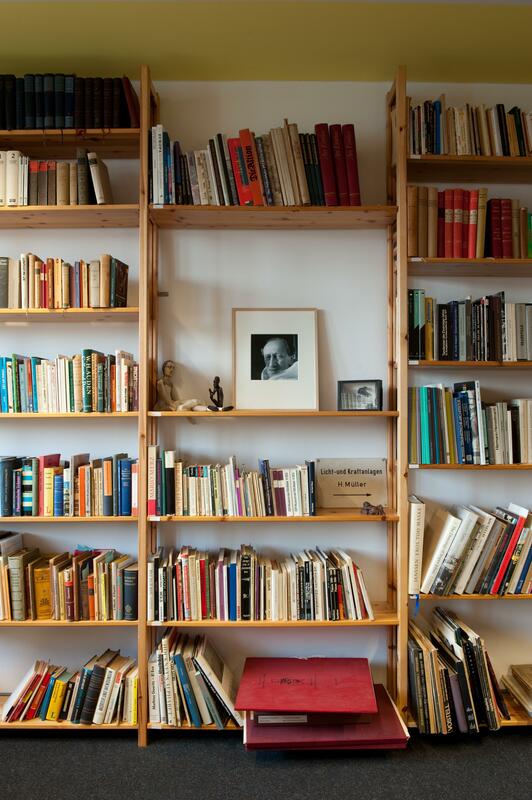 The Heiner Müller estate library contains about 7 800 volumes, mainly focusing on the history of theatre. But it also contains some of the crime novels he read, and shows above all how Müller made use of his books. Many handwritten notes, drawings and scribbles prove an intensive use of his collection. Heiner Müller's collection of records, art works, everyday objects and work tools from his apartment, are also part of the "Transitraum". The archive is constantly being expanded to include testimonies about Heine Müller's work. This includes interviews with witnesses, collected programs or stage documentation. Association of Literary Societies and Museums e.V.